Mar. 1, 2017: The annual open meeting of the Boulder Ledge Garden Club will be held at the Bronxville Library on Tuesday, March 7, from 1:00 to 2:30 pm. The guest lecturer will be Alejandro Saralegui, director of the Madoo Conservancy in Sagaponack, New York. Alejandro was born and bred in Bronxville. Madoo, a two-acre public garden, is noted for both its design and its plantsmanship. Refreshments will be served following the meeting. Garden enthusiasts are welcome! 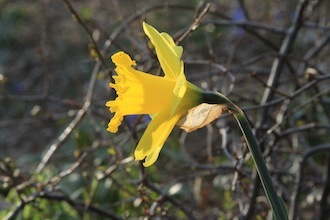 Pictured here: A daffodil taken in a previous year.